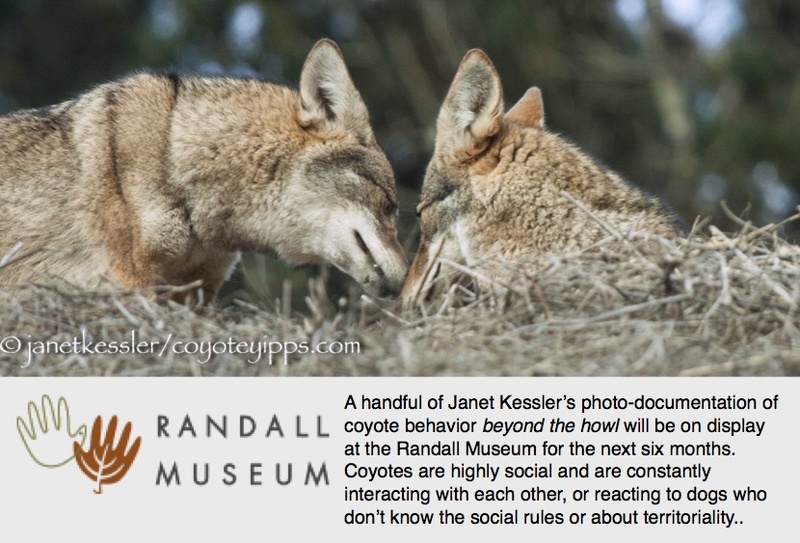 Even before mating, the alphas in any coyote family (the established adult mated pair) start preparing for “the event” of the birth of a new litter of pups. Only the alphas in any coyote family reproduce, which has the effect of limiting the population density in any given territory and area (see Frank Knowlton in 1972). The process begins months beforehand, when the female ensures that she alone will be the one within the family and on the family’s territory to produce offspring. Her objective is to become the one and only Queen Bee. Female offspring who have “come of age” so that they are reproductively viable — usually during their second year — become viewed as possible reproductive competition to their mothers. The alphas are extremely jealous and possessive of their mates at this time. Their ploy involves several tactics, including simply keeping yearling females away from their Dad. This, in-and-of-itself wouldn’t do the trick since there are many instances when daughter and father could find themselves together when Mom was not around. So another tactic is a little rougher, and this video shows how it happens: a mother wallops her yearling daughter to either disperse her or to instill fear so she won’t reproduce. Apparently stress blocks reproduction. I don’t know if these bio-functions are involved, but it seems that they may be. In the video, note the angry, low-tone growls which are so much quieter than their howls. Here you have communication to one individual, not everyone. Towards the end of this period of antagonism towards yearling daughter, which can go on for months, courting and mating take place between the alphas (see Courting Behavior and Courting Behavior in Full Swing). Then and only then, after estrus is well over and Mom is plump with developing offspring, will Mom begin to slowly relax her antagonistic behavior towards daughter, and slowly things calm down again between the two into a state of normalcy approximating what it had been like before the reproductive cycle headed this way. As the time of birthing nears, I’ve noticed that the birthing moms are less out-in-the-open. This may be due to their becoming more protective of the treasures they are holding inside, but it also could be that they are busy with other things, for instance, this is when dens are dug. Here is a female who has plumped up during pregnancy. But the female isn’t the only one to change her behaviors for this event. Also, Dad becomes very protective of the female. I never saw this Dad become aggressive towards his yearling son, however, one day the son was gone. Had the son crossed the line — gotten too close to the female who was his mom? — I don’t know. Dad’s job during the birthing process will be to stay away and to stand sentry. He will position himself not far from the den where he will remain for hours on end, keeping an eye out for any possible trouble. Birthing puts coyotes into a very vulnerable situation, which is why the job of protector is so important. So, the next step is pups. I stay well away from anywhere I suspect there might be a den, so it will be months before I see what she produced. The expectant parents: any day now! It’s true that coyotes have chased dogs, but almost always this occurs after the coyote was chased first. To most people, a dog chasing a coyote looks much like a dog chasing another dog, or a dog chasing a squirrel. It looks like a game. Focused-in closer, it looks like a terrorized coyote running away from danger more often than a game. Wild-animals instinctively know that any injury could compromise their ability to hunt and fend for themselves, and therefore their survival: fleeing from possible harm for them could be a matter of life or death. Fortunately, coyotes are smart, and they are quick: most can get away. Nevertheless, energy expenditure during an attempted escape is enormous, and not something any animal wants to put up with. In the case I’m depicting here, the owner had been playing tennis, with his dog sitting there calmly on the court with him. When the owner noticed a coyote beyond the court on a hill, he went over to take a photo, which attracted the dog’s attention to the coyote. In a flash, the dog was after that coyote. They ran zig-zag all over the steep incline, through uneven piles of brush and wood-piles. It was not an easy chase for either of them. One false move — a misplaced step in a hole or on a sharp stick — and the threatening dog could tear into the wild animal, whereas the dog probably didn’t comprehend the chase as anything more than a game. The dog could stop whenever he wanted. Coyotes being very light-boned, sinewy, stream-lined and lithe can handle steep inclines and debris better than dogs who are more muscle-bound and heavier, and lead a more indoor life. The heavier dog wore out first, and it is at that point that the owner was able to finally grab his evasive and excited dog. Notice that the coyote’s tail is tucked deep under and his hackles are up, his ears are back and he’s carrying himself low: he’s running scared. I spoke to the owner after the event. He told me he had feared for the life of his dog as he tried to recall his dog, a 70 pound solid-looking dog. I told him that, in fact, his dog could have killed that little 25 pound coyote. The surprised owner opened his eyes wide: “Oh!” He hadn’t thought of that: it made immense sense to him and he wanted to know more. It was not the answer he was expecting — in fact, it was indeed an eye-opening revelation to him. He had heard only that coyotes attack dogs. I gave the owner the link to the video, Coyotes As Neighbors, and when I next saw him he told me that his view of coyotes had changed. Now we have someone else onboard to help us spread information about coexistence: Yes, you must keep your pets away from coyotes for TWO reasons: to protect your pet, and to protect the coyote. Leashing the dog when coyotes are around is the best way to accomplish this. Hind legs are extended out in back and left limp, while the forelegs pull her down the hill! Whee! It’s fun, whether or not an itchy tummy is involved. I’ve caught stills and a video from separate occasions. The video at the end is the tail-end of another such belly sliding session — I missed capturing the fun part but her happy-go-lucky and bouncy mood is captured in her gait as she hurries off.